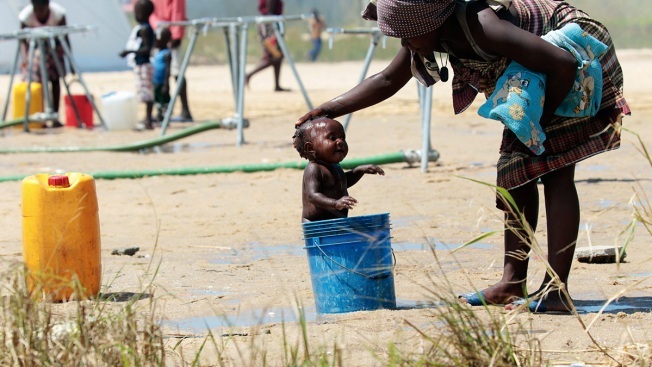 A mother bathes her baby in a bucket at a camp for displaced survivors of Cyclone Idai in Beira, Mozambique, March, 31, 2019. Cholera cases among cyclone survivors in Mozambique have jumped to more than 250. One person has died of cholera, while 97 patients remain in treatment centers, with the others released, Mozambique's health director Ussein Isse announced. The new figures are an indication that cholera is spreading but is being brought under control, health workers say. U.N. spokesman Stephane Dujarric said there is also a high risk of the spread of infectious diseases including those caused by insects like mosquitoes, with 276 malaria cases also reported in cyclone-affected areas,. "A vaccination campaign against cholera, with 900,000 doses of the vaccine, will start Wednesday," Wightwick said. "That should blunt the edge of this outbreak." Sanitary water points and latrines are being constructed throughout Beira by the International Federation of the Red Cross, which has also established a field clinic in Macurungo, is constructing a field hospital in Nhamatanda and distributing relief supplies to 800 in Buzi, said the group's spokeswoman, Jana Sweeny. "This lifesaving emergency food assistance will support approximately 160,000 people for one month," Mearkle said. The U.N. Economic and Social Council has scheduled a special meeting in New York on Tuesday on the "Response to Cyclone Idai in Mozambique, Malawi and Zimbabwe."